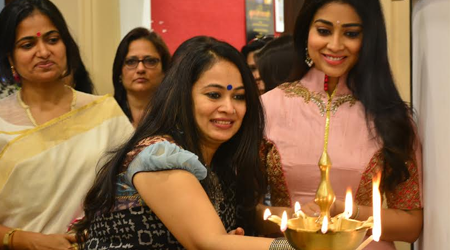 Mumbai based eminent artist Rakhi Baid art exhibition “Krishnansh” was inaugurated Bollywood actress Shriya Saran in Jehangir Art Gallery, Kala Ghoda, Mumbai. “Krishnansh” In her recent exhibition of paintings Rakhi Baid, explores the divine connection that she feels with the Lord Krishna. Her paintings exist in a world where love and harmony are expressed through the divine play, 'leela' of the lord. From the very beginning Rakhi is attracted towards the form of Krishna. She says that Krishna is a symbol of eternal love. Krishna’s deep blue color is also the color of eternity. This blue encompasses all, the sky, and the deep ocean. Colors and melody are seamlessly fused in her paintings. A flute, a musical instrument or bells are a constant motif, appearing in almost all of her canvases. The symbolic presence of Krishna and the joyous representations provokes one to make references to the mythical Krishna and his idyllic world of joy. The artist feels that the melodious sound of Krishna's flute thrills all hearts with rapturous joy and immense delight. Just like love, music can universally bind people around the world. In one of her painting she has shown Krishna with Violin and pigeons in muted colors background which talk about universal peace. Born with an intrinsic talent and creativity Rakhi is a self-taught artist from a small town of Rajgangpur in Odissa. The cheerful artists says, "In shadows I remained, ‘ART’ drew me towards the light of existence and gave a new meaning to my being. Painting came to me as a medium to give a way to my emotions that remained untold. ART is a way of living life in harmony with oneself." Rakhi has held successful Solo and Group shows in various galleries in India and internationally. Her works have won awards and are in the Private Collections in India and abroad.